An English naval officer gets a tattoo from a Japanese tattoo artist. On the right is a display of samurai armor. In the West, Japanese tattoos were a stereotypical part of an eroticized image of Japan. Many society figures got a Japanese tattoo when visiting the country, such as the Grand Duke Alexis of Russia, Queen Olga of Greece, Lady Randolph Churchill, and the Duke of Newcastle. 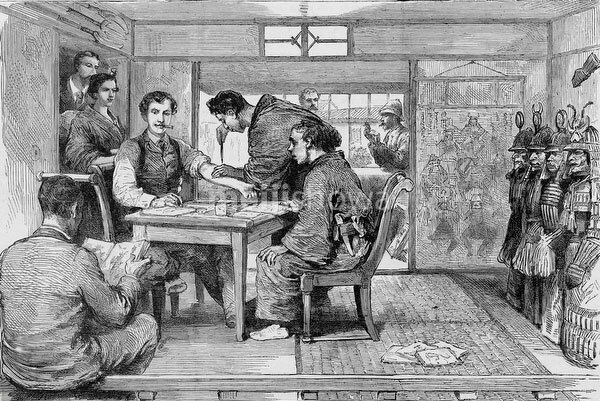 Published in the British weekly illustrated newspaper The Graphic on November 13, 1886 (Meiji 19).